What’s the difference between 3-ply (tri-ply) and 5-ply and 7-ply? Does pot material matter for sous vide cooking? Does cooking food create toxins and carcinogens? Is Induction More Efficient Than Electric Coil or Gas? What’s the healthiest cooking oil? Food forgery has gone on for centuries, as Bee Wilson noted in Swindled: The Dark History of Food Fraud, from Poisoned Candy to Counterfeit Coffee , and it’s happening today. There are outright frauds, like artificial sweeteners posing as real honey, or olive oil where some other vegetable oil is used in place of real olive oil. Other cases are dubious and best avoided. 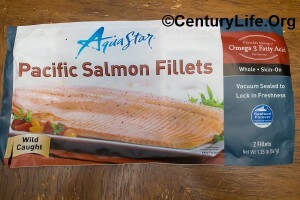 For instance, have you ever wondered why allegedly wild salmon from the USA somehow is also a product of China? Someone catches what might be wild salmon, ships it to China, where it is vulnerable to mixing with non-wild salmon, where low-paid laborers cut up the fish. The results are shipped back to the USA. That doesn’t mean that you’re entirely defenseless against food fraud. I’m creating a simple guide sorted by alphabetical order that I will keep adding to over time. New York Times articles like Fish Are Commonly Mislabeled, Study Finds and Survey Finds That Fish Are Often Not What Label Says are representative of a rising tide of discontent regarding fake fish. The studies find that a large fraction of retail outlets sell mislabeled fish. Even restaurants are fooled sometimes. There have been other studies, too like this ad hoc sampling in New York where some of the outlandish “explanations” offered by fish merchants were downright funny. The problem is especially bad for those who eat a disproportionate amount of seafood, such as sushi-lovers or those who are trying to cut down carbs by eating more of everything else. If you thought you were eating low-mercury seafood and it turns out that someone sold you high-mercury seafood, that has obvious deleterious effects on your health. The good news is that scientists can analyze fish DNA to conclusively determine the origins of the fish. This is known as “fish barcoding.” Unfortunately, fish barcoding is not yet mandatory, so testing is spotty. 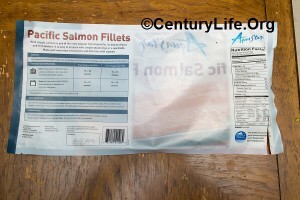 Until the FDA and consumer protection agencies force compliance, you can attempt to protect yourself by buying seafood from businesses affiliated with the Better Seafood Board, on the theory that it would take an especially daring, hypocritical business to be on that member list and to cheat customers at the same time. Federal regulations governing country-of-origin labeling only apply to full-service markets like grocery stores, not to fish markets. So you might want to stick to actual grocery stores for fish unless you really trust your local fishmonger. It bears mentioning though that even stores might inadvertently sell you short. As the 2005 NY Times article noted, the Whole Foods “wild” salmon appeared to be farmed salmon that escaped into the wild. That’s not Whole Foods’s fault, but it bears mentioning. Also, watch out for fish that is labeled both wild and a product of China. A typical example is frozen wild salmon from China. In theory, wild salmon caught in US waters is shipped to China (or some other country with low wages) for hand processing (e.g., de-boning and packaging), and then shipped back to the US. In practice, this long journey is vulnerable to cheating, such as Chinese processors substituting wild fish with farmed fish, or even switching species. Ann inexplicably bought some frozen “wild” salmon processed in China recently, apparently because her coworker said good things about it. I wanted to return the package right away because I’m a total snob when it comes to things I put into my body, but she lost the receipt, so we reluctantly cooked it. 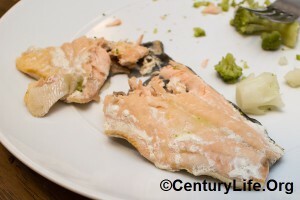 The result was an inedible, flavorless mess that I’m not even sure was salmon. Due to fear of mercury/heavy metal poisoning (it tasted very metallic), we threw it out. Update: Ann wrote a letter of complaint to the company. Six months later, the company has yet to respond. I’m not going to assume the worst. Maybe it was an honest mistake by one of their suppliers. But the bad experience and the lack of response means that we’re never buying their products again. Herbal supplements are notorious for being adulterated, and this 2015 New York Times article highlights how bad the problem is. Yet fakes continue to be sold at major retailers like GNC, Target, Walgreens, and Wal-Mart. There isn’t an easy way to figure out who is cheating you or not, so if you really want to be sure, you may want to buy from a farmers’ market or grow your own herbs. Even if you buy non-store-brand supplements, as we’ve seen in olive oil, that’s not any guarantee that the product is legitimate. And many store brands ARE legitimate. Did you know the EU bans Indian honey imports due to contaminants such as heavy metal and antibiotics? The FDA does not. It turns out that oft-contaminated Chinese honey is shipped to places like India and Vietnam to conceal the true the country of origin. Then it’s shipped to markets with weak regulators, such as the USA, which imports about half of its annual consumption of 400 million pounds of honey. About 65 percent of honey goes not to end-use customers but to food processors. Since it’s possible to trace honey via pollen type, crooks resort to “honey laundering” where they pump hot honey through filters to eliminate this method of detection. They may then dilute it with artificial sweeteners which are cheaper to produce. Since honey laundering is so prevalent, you may want to stick to domestically-produced brands. Raw honey contains nutritious impurities that are not found in pasteurized/processed (heat treated and finely-filtered) honey. Heat treating and filtering is totally unnecessary; it just helps honey laundering and filters out beneficial impurities that distinguish honey for ordinary sugar. Natural impurities like pollen, B-vitamins, antioxidants, and antimicrobials help boost your immune system and help fight allergies. Honey also does not raise your blood sugar as much as other sugars, and honey also reduces C-Reactive Protein (an inflammation marker). Honey needs no refrigeration because it never goes bad and at worst just crystallizes–making it a good prepper food. All those antimicrobials and the low water content make honey basically immune to bacteria, which is a good thing because bees in nature do not have refrigerators. Organic honey should be preferred because of the possibility of contamination in the environment in which the bees collect pollen. Although crystallized honey is safe and can be used like any other solid sugar, you can make it liquid again simply by heating it slowly, e.g., putting the jar of honey in a bowl of warm water. Microwaves heat unevenly, so that’s not a good way to de-crystallize honey as you may burn some crystals and liquefy others. Organic Mountains 100% Pure Raw Honey, Orange Blossom – Sourced from Florida, Texas, Arizona, and California from bees that have access to citrus trees. Organic and with a hint of citrus. Wee Bee Naturally Raw Honey – Raw. New York/Florida. They claim pesticide-free (too cheap to pay for organic certification) and it’s well-regarded. It’s not syrupy but more crystallized the way it is in nature. Winter Park Honey – Family owned USA company. Colorado and Florida. They sell honey made from various types of pollen, but some are not certified organic. Beware of bottles of honey that are blended from multiple countries. One scam is to ship inferior honey to a middleman country, where the bad honey is mixed with a bit of decent honey. The blend is then reshipped to the final destination, bearing the name of the middleman country. UC Davis is a major research university with particularly good agriculture-related labs. Its Olive Center has has produced several reports in recent years about real vs. fake extra-virgin olive oil (EVOO), such as this 2010 report and the followup 2011 report. The 2010 report basically says that about that 2 out of 3 imported EVOO samples from various California stores did not meet IOC (Int’l Olive Council)/USDA standards. Common reasons included oxidation due to light/heat exposure or age; adulteration with cheaper olive oil; and poor oil quality due to sub-optimal olives, processing, or storage. 9 out of 10 California samples meet EVOO standards. Check the bottle for North American Olive Oil Association (NAOOA) certification. NAOOA is a trade group that purports to test olive oils to see if they are authentic and meet specs. Brands that failed to qualify as EVOO more than 50% of the time, in order of best to worst oil: Colavita (56% fail), Star, Bertolli, Filippo Berio, and Pompeian (94% fail). Brands that had low failure rates: California Olive Ranch (0%), Cobram Estate (0%), and Lucini (11%). You might try restaurant/food service olive oil, but UC Davis did a study on that and found that 60% of foodservice EVOO didn’t make the grade, either. About 12 percent of spices imported to the US are contaminated, sometimes by insect and rodent filth, such as rat poo. 7 percent test positive for salmonella. There’s no easy way to deal with this, but the FDA report noted that India and Mexican spices were among the worst offenders, so I would steer clear of spices imported from India and Mexico and try to source from domestic producers whenever possible. And by source, I mean either buying from a US supplier or growing them yourself.